The Scriptures are a verbal message from God, in words. We sometimes call it the “Word of God”. God has gone to great lengths to communicate His love to us, both in words in a Book, and in giving us His Son (the story of which we also read about in a book… in Hebrews 1:1-2). Sometimes, there are barriers to undertanding this message. Often we think of the enterprise of Bible translation itself as one means of overcoming this barrier, and you would be right. Each of us reading this now has benefitted from someone having translated the Bible into your language, English: the language I am writing to you in, and which you are reading. But this communication also assumes that in the course of your life you have had the opportunity to read English fluently. To many, the Bible still remains a closed book if they have not adequately mastered literacy. Pictured above is a page from the Bible in Western Cree, opened to Matthew chapter 5, the Sermon on the Mount. This book belonged to a believer who invested years of his own life to learn to read and understand what is written in this book, and as a result he was blessed with the skill to grasp the hope and love that this message communicates in the Cree language. But the reality is that among speakers of the Cree language (and indeed, many other First Nations languages) there is only a small minority who have learned to adequately read their mother tongue. 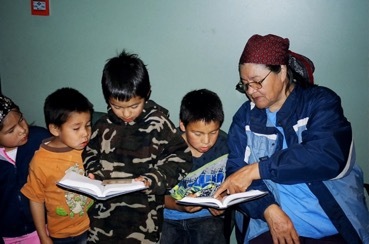 It is true that First-language literacy education continues to gain ground among children in communities that are developing indigenous language curriculum in their schools. But for some, literacy in their traditional language remains out of reach. But we all know that one way we can overcome this literacy barrier quickly is to simply have someone read a book TO us. This is why in many languages where we serve in Bible translation ministry there are also important efforts to make the Good News of the Scriptures available in non-print media. For the old translation of the Bible in Western Cree, this began with the CreeTalker project. 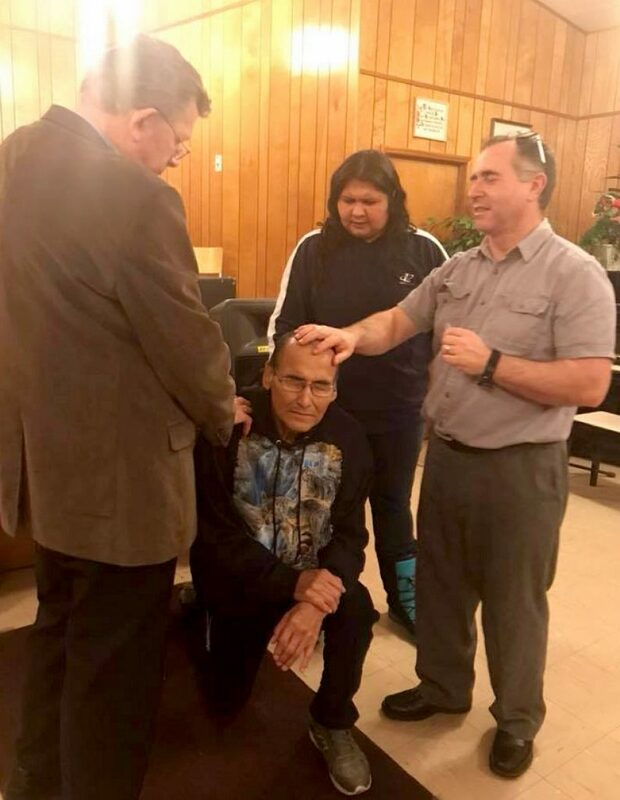 In the fall of 2017, at the request of Cree speakers in Saskatchewan, Pastor Mark Ramshaw contacted us about the availability of the Cree Language Scriptures in audio, so they could listen to and hear the Word of God in Cree. 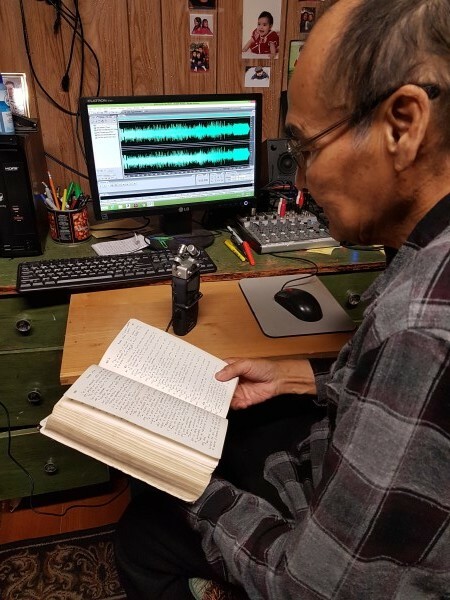 While the Canadian Bible Society and Wycliffe Bible Translators have been working for some years on a new Contemporary Plains Cree translation, and most of the Cree Scriptures that have been published recently also have an audio narration, Pastor Mark and the Cree speakers he represents were actually interested in an audio recording of the old Western Cree Bible, that was first translated by Rev. William and Sophia Mason and published in 1862. This edition was later revised by Rev. J. A. Mackay in 1904 (New Testament) and 1908 (Old Testament). 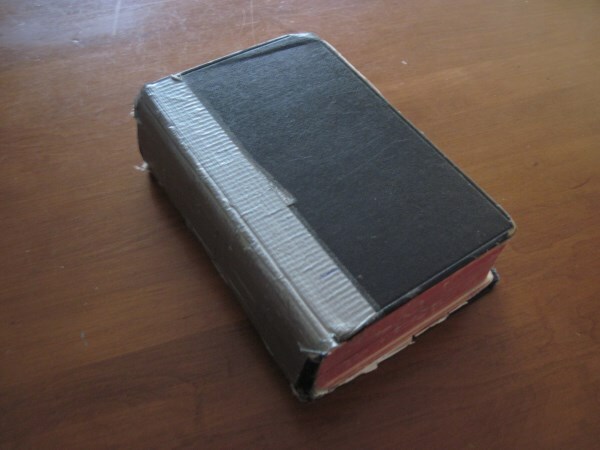 This Bible has been reprinted many times over the past century by the British and Foreign Bible Society, and is still much loved and revered by people in many First Nations communities across Ontario, Manitoba, Saskatchewan and Alberta. After making some inquiries, it was found that no audio recordings of this Cree Bible were yet available. 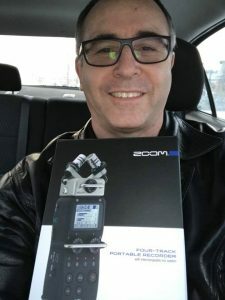 So Pastor Mark stepped out in faith to establish the “CreeTalker Project” which would undertake the production of a spoken audio version of this edition of the Cree Scriptures. Pastor Mark secured some donations to purchase the recording equipment that would be used for this project. Rev. Fred Evans, Cree speaker and longtime preacher and evangelist in the Cree language, graciously agreed to be the “voice” for the CreeTalker Project. Bill helped Fred & Mark to facilitate the technical end of setting up the recordings, best practices for file handling, editing software, and a quality control procedure. 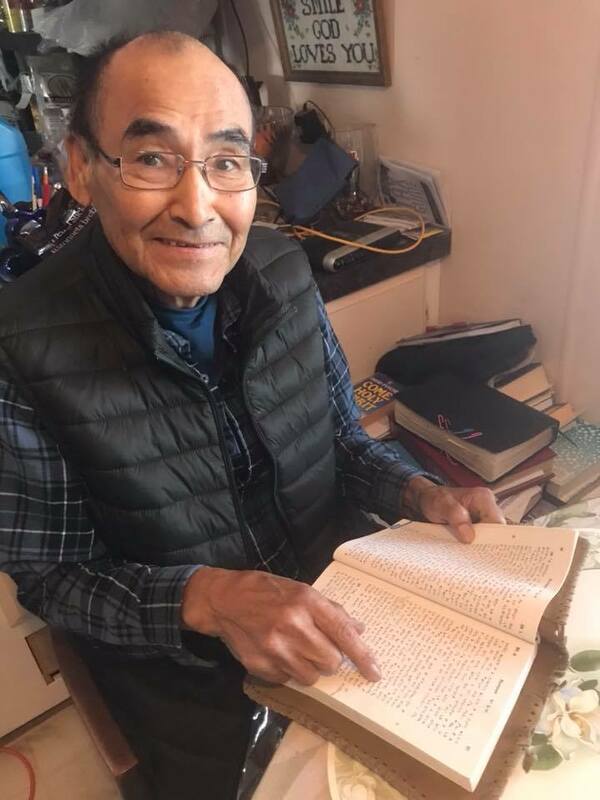 By December 2017, Fred had begun to read and record the old Cree Bible in his home in Swan River, Manitoba, starting with the book of Matthew. 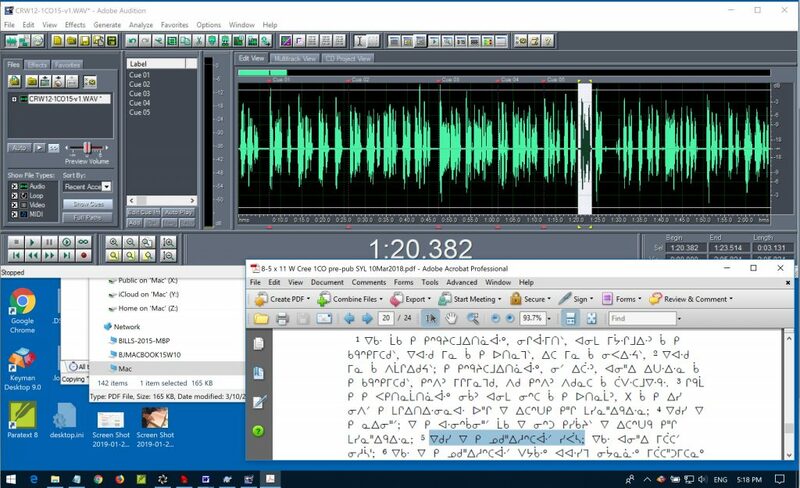 As Fred finished his recording of each chapter, he would send these files on to Bill by Internet connection, and he would listen to Fred’s recording, take care of the audio-editing of the sound files while reading along with the Cree text, and look after sound enhancement and overall quality control. Over the first 9 months of the project, Rev. Fred has recorded nearly 80 hours of “raw” (unedited) audio files, creating one computer sound file for each of the 260 chapters of the New Testament. For every hour of this recorded audio, it can take from four to six hours of editing work, carefully following along with the printed Cree text, removing false starts and mistakes, making the pauses and phrasing consistent, and bringing the sound quality and volume to adequate levels. 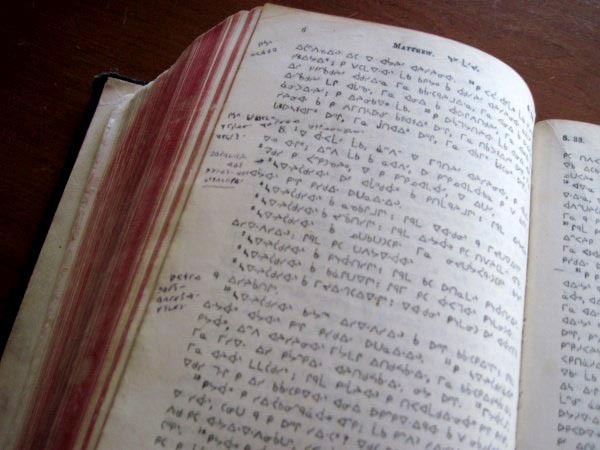 Over the past several years, the Canadian Bible Society has been working toward a new reprint of the text of this legacy Cree Bible, and has digitized the text and is preparing to re-publish it to make it accessible in both Cree Syllabics and in the Standard Roman Orthography. Pastor Mark contacted the Bible Society early on in the project to coordinate the audio distribution and production. In the spring of 2018, Ben Wukasch began to work at the Bible Society offices. 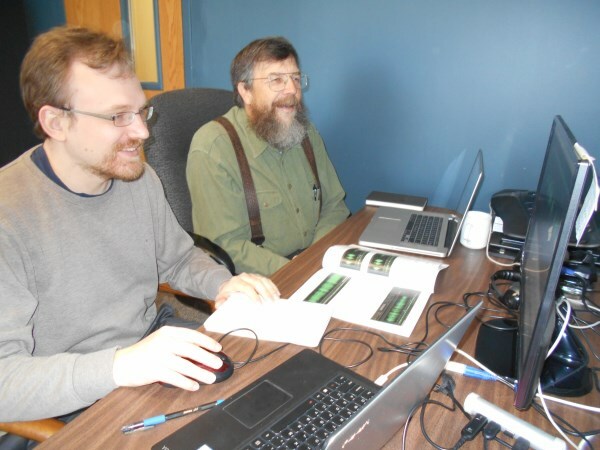 Bill went to set Ben up with the software and training so that he could help with the audio editing task too. Since May 2018, both Ben and Bill have been doing the sound editing for Rev. Fred’s recorded chapters. 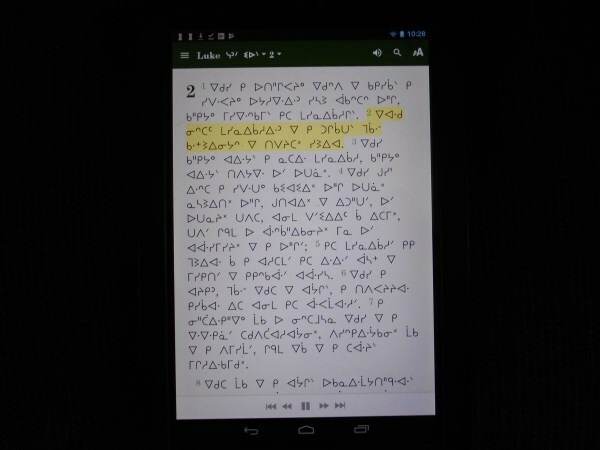 In February 2018, Bible Society leadership asked Bill to work on a “demo” of a Scripture app that would integrate Fred Evan’s narration and the written text of the Cree Bible, synchronized so that users could hear Fred read while following along with the text. By the month of March, a working version of the CreeTalker Scripture app was ready to be tested on a limited basis. At that time, the entire book of Matthew was ready to hear and see in the demo format. 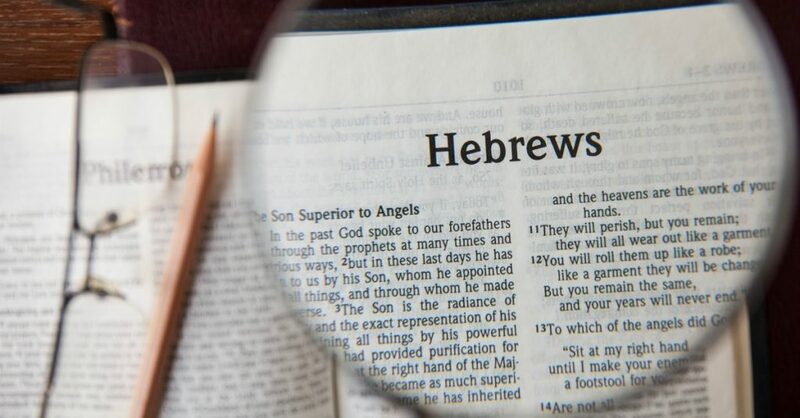 Using specialized software that integrates the printed text of the Bible with the audio recordings, each verse is timed to highlight the spoken word so that the user can read along, following the words on the screen. The software then creates an “app” and talking EPub books that can be installed on smartphones, tablets or computers, which will enable users to take the Cree New Testament along with them and listen to Rev. Fred read the Scriptures to them whenever they like. This two-minute video provides a demonstration of what the Bible app or talking eBooks will be like when the project is complete (turn on your audio to hear Rev. Fred’s narration). Ben and Bill estimate that they have a little over a month of editing work to do on the audio files before the entire New Testament is ready.